I really enjoyed Fire. Despite complaints that I’ve seen in regards to Fire character I found her engaging and believable because I know firsthand that beauty can be a curse. Beauty can also leave you feeling entitled and considering Fire is so very desirable I find her to fit the role quite well. Fire is sweet, sensitive and trying to figure out how to deal with her past while forging a happy future, the sins of our past can really detour us from the potential we all hold and I believe Fire does a fantastic job bringing that to light. I was very pleased that she did out use her powers for selfish gain and that her uses of power were to either defend her-self or help defend the kingdom. I really enjoyed the character developments and how the relationships between characters evolved and changed throughout the course of the book. I found all the characters had a strong voice, strong personalities and were all easily imaginable as I read through the book. They all blended in nicely. My only issue with character development was with Leck, since he is mentioned in the prologue I figured he would have a more definitive role in ‘Fire’ however, he was hardly mentioned at all and I found that part of the novel to fall flat, which is why I’ve given Fire four stars instead of five. I was really looking forward to his development and the issues he’d bring so I was very disappointed in that regard. Thought that Kristin Cashore did a great job describing grief; grief is a dark, depressing, and horrible feeling, it was written truthfully and in a way that you identify with. I really enjoyed this novel and I am very much looking forward to reading BitterBlue. 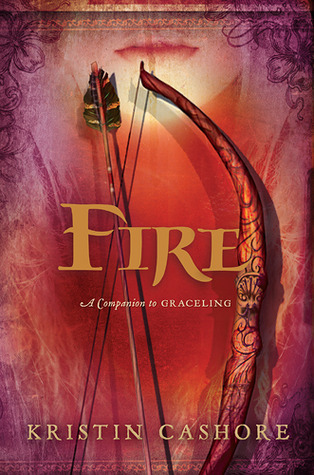 Have you read Fire? What did you think about it?